If you have a missing tooth, you may have problems eating, speaking, or smiling normally. You may feel as though your missing tooth is a permanent addition to your appearance. Luckily, you can fill in your gaps with dental implants. Understanding how this procedure works and what it can do for you can help you make an informed decision on the best tooth replacement option for you. Find out more about dental implants with Dr. Andrew Yoon at Cape Vista Dental in Orange City, FL. Dental implants are the closest tooth replacement option available to natural, healthy teeth. Your dentist uses a surgical procedure to place the implant’s fixture, which resembles a screw and is made from titanium, into the jawbone beneath your missing tooth. This process allows the bone to grow around the implanted fixture during the healing process, an event called osseointegration. After the fixture is fully healed in the bone, your dentist will open the gum tissue on top of the fixture to place an abutment, which connects the fixture to the prosthetic tooth. An implant fixture replaces the tooth’s while the prosthetic tooth fills in the gap above the gum line. Implants look, feel, and function just like natural teeth and will leave you with a beautiful, functional smile. 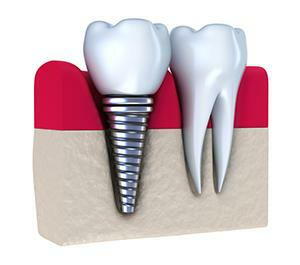 Implants can replace a single tooth using one implant fixture placed into the bone and one prosthetic tooth which fits on top of it. However, implants can also replace several teeth in a row using a bridge-like restoration held in place by one implant on either side. If you are missing all or most of your teeth, you may benefit from an implant-supported denture, which uses four or more implants across the arch to hold a denture in place. Though the benefits of dental implants are numerous, one of the greatest advantages is that implants keep the bone underneath your teeth stimulated, something that traditional dentures or bridges cannot do. This helps to avoid the effects of missing teeth like bone atrophy, which can cause a prematurely aged appearance and shifting teeth due to the extra room the gap provides. For more information on dental implants or their benefits, please contact Dr. Yoon at Cape Vista Dental in Orange City, FL. Call (386) 774-0125 to schedule your appointment today!